David De La Pena worked his way up from the plant yard to plant operator at New Leaf Biofuels. Making clean fuel and raising a son in Barrio Logan. 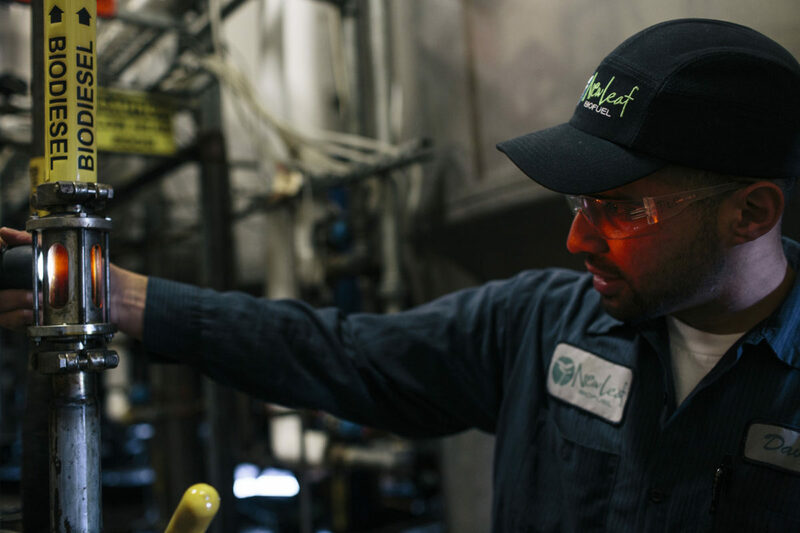 One day in 2011, 27-year-old David De La Peňa walked into New Leaf Biofuels on Newton Street in the Barrio Logan area of San Diego and asked for a job. He had been working in construction, 50 miles away from his home, in San Marcos. As the recession slowly killed off construction jobs, he started to look for something close to his home in Barrio Logan. He had a new baby son and he needed to be near his family and needed to spend less on gas. David had a lead on a job at a sandblasting plant down the street, so he started there and just kept going. “I went to 20 or 30 plants on Newton. I knocked on every door,” he says. New Leaf, a small plant that makes biodiesel out of recycled fryer oil from San Diego restaurants, hired him. They put David to work in what they call “the yard,” where a particular used fryer fragrance and a thin coat of cooking oil cling to everything. A couple of adopted street cats hang around waiting to be fed and the trucks regularly pull up to deliver oil. David started out doing maintenance, cleaning up and off-loading oil from trucks—sending the oil through the auger and shaker to clean it before it goes into giant tanks inside the plant. Now, four years later, David has worked his way up to be a plant operator. He blends and tests the fuel, monitoring it on several computer monitors as it goes from fryer oil to a biodiesel that you can run in any diesel vehicle. Because he can operate the whole plant and knows how to run the yard too, he’s become a valued member of the staff. He’s a quiet person with a gentle but determined demeanor that endears him to his boss and co-workers. But his job at New Leaf has been far from a sure thing. He’s seen his co-workers laid off and he’s been through two rounds of pay cuts as oil company lawsuits against California’s Low Carbon Fuel Standard (LCFS), together with constant stopping and starting of federal incentives by Congress, have provided an unstable market for biodiesel and alternative fuel startups like New Leaf. “New Leaf lives and dies by the state and federal policies that allow biofuels to compete with fossil fuels,” explains New Leaf’s CEO, 38-year-old Jennifer Case. New Leaf started in 2006 as a result of a federal tax credit signed by President George W. Bush in 2005. In 2006, California passed its bedrock clean energy law, AB 32, known as the Global Warming Solutions Act, which requires the state to reduce emissions and encourages a market for cleaner, lower carbon fuels like biodiesel. According to the Air Resources Board, fuel recycled from waste grease reduces greenhouse gas emissions by 82 to 88 percent compared to petroleum diesel. The federal incentive for products like New Leaf’s biodiesel is facing its fourth lapse. Congress reinstates it retroactively every time, but with quite a lag between lapse and re-adoptions that causes a lot of small biofuel plants to go out of business, Jennifer explains. That makes California’s LCFS all the more important. “We have to be competitive with fossil fuel. That’s why these incentives exist. There’s an added cost to blending biodiesel because the infrastructure doesn’t exist. 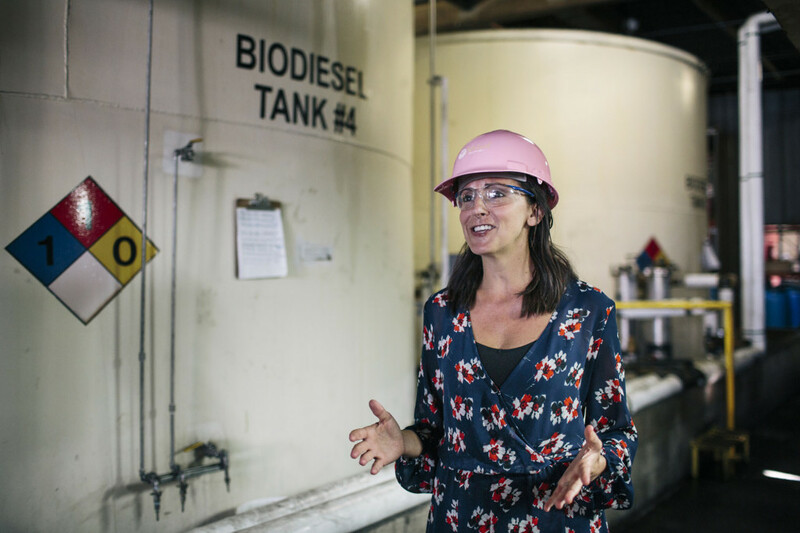 Without the incentives, there’s virtually no way to make biofuels profitable,” she explains. Jennifer spends a lot of her time lobbying to keep in place the policies designed to overcome the market advantage giant fossil fuel providers enjoy, with their established and subsidized infrastructure and economies of scale, even as they get a free pass on their pollution costs. Sadly, the fact that biofuels are better for our air doesn’t guarantee their success. Jennifer was the first woman on the National Biodiesel Board and is a board member of the California Biodiesel Alliance. “I am passionate about this industry. I wouldn’t have survived the last five years if I hadn’t been,” she says, as her blue Nikes step off the treadmill she keeps in her office in a humble building on the edge of the plant’s yard. “We’re providing these jobs in an industry that’s new and exciting but you have so much on your shoulders,” she continues. New Leaf has about 22 employees now. But last June, in the face of legal challenges to the LCFS, the company laid off half its staff, idled the plant back to one-third of its capacity and cut pay by 10 percent. Despite that, they got another investor, in large part because the LCFS looked like it would be readopted, Jennifer says. Because of the pay cut, David, a single father, had to cut back on little trips he does with his four-year-old son, also named David. 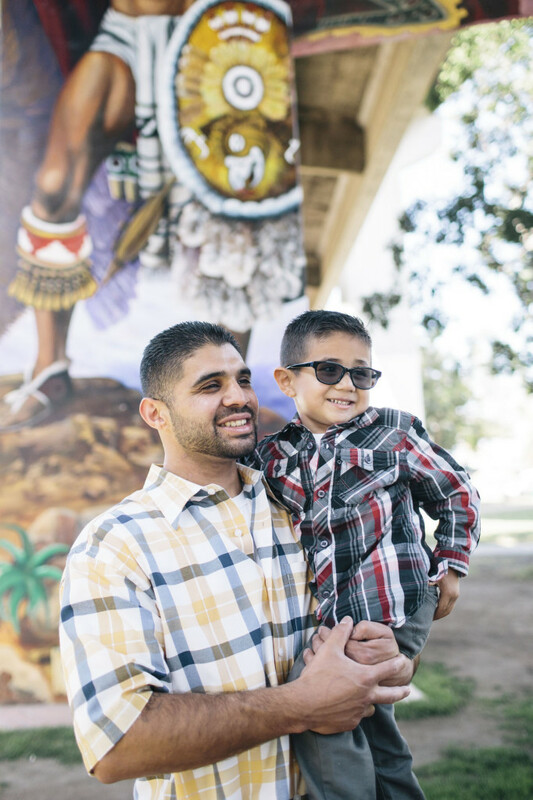 David De La Peña, 27, is a single father raising his son David, 4, in San Diego. When the recession threatened the construction work he was doing, he walked door to door asking for a job at more than 20 different plants. He found one at New Leaf Biofuels where he has worked his way up to be a plant operator. But as things have improved, New Leaf restored everyone’s salary and paid all of its employees back what they had lost while wages were cut. New Leaf also provides medical and dental benefits for David and little David, who looks like a little scholar in eyeglasses he’s worn since he was a baby. Quiet and shy like his dad, the two have a special bond. His dad carefully holds his hand as they walk down the street. Because he’s taking care of his son with help from his family, working close to home is really important for David, who works the swing shift from 3 -11:30 pm. On the way to work, he drops little David off with his grandma, who lives two blocks from New Leaf. His aunt picks little David up at 4:30 and takes care of him until she goes to work at Children’s Hospital at 6 a.m. David takes care of little David until he goes to work and the cycle repeats every weekday. David’s father and grandmother have lived in Barrio Logan for 40 years. Homes line one side of Newton St. and small industrial plants line the other. A few blocks from New Leaf, an amazing taco restaurant, Las Cuatro Milpas, draws visitors from all over and a line forms out the door and down the street every day at lunchtime, just a block from Chicano Park under the freeway overpass. The neighborhood organized to keep Chicano Park, where little David likes to play, from being developed. Every available cement wall and pillar is covered in beautiful bright colors, traditional Chicano murals commissioned from local artists. Chicano Park seems to embody both the urban grit and fierce local pride of Barrio Logan. “People from this neighborhood knock on our door and ask for jobs all the time. We love that,” Jennifer says. David’s uncle now works in the yard at New Leaf as well. And she hopes she can keep them both.